"Understanding that the Church is a learning laboratory helps us to prepare for an inevitable reality. In some way and at some time, someone in this Church will do or say something that could be considered offensive. Such an event will surely happen to each and every one of us—and it certainly will occur more than once. Though people may not intend to injure or offend us, they nonetheless can be inconsiderate and tactless. "You and I cannot control the intentions or behavior of other people. However, we do determine how we will act. 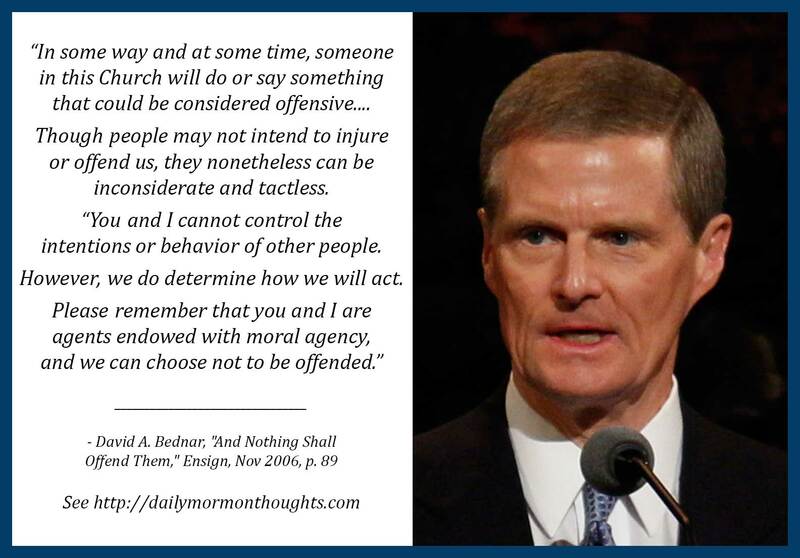 Please remember that you and I are agents endowed with moral agency, and we can choose not to be offended." It's an important foundational principle to remember that the Church exists as a "learning laboratory" where imperfect people are growing and developing. Elder Bednar reminds us that we often "practice on each other" in that process of learning and growing. And that we make mistakes along the way. We sometimes say or do things in our interactions with each other that are less than perfect, and that are even "considered offensive." 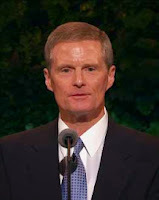 Elder Bednar expects that will happen to every one of us, more than once, during this time of training. If we remember that we're all in the process of learning and developing, it helps us to not over-react when those events occur. The Savior set the perfect example for us with his words, "Father, forgive them; for they know not what they do." (Luke 23:34) The real key to the whole concept lies in Elder Bednar's closing statement: we are all "agents endowed with moral agency, and we can choose not to be offended."